Sabudana Kheer is an easy and delicious pudding prepared during festive times and also popularly prepared and served during fasting days. 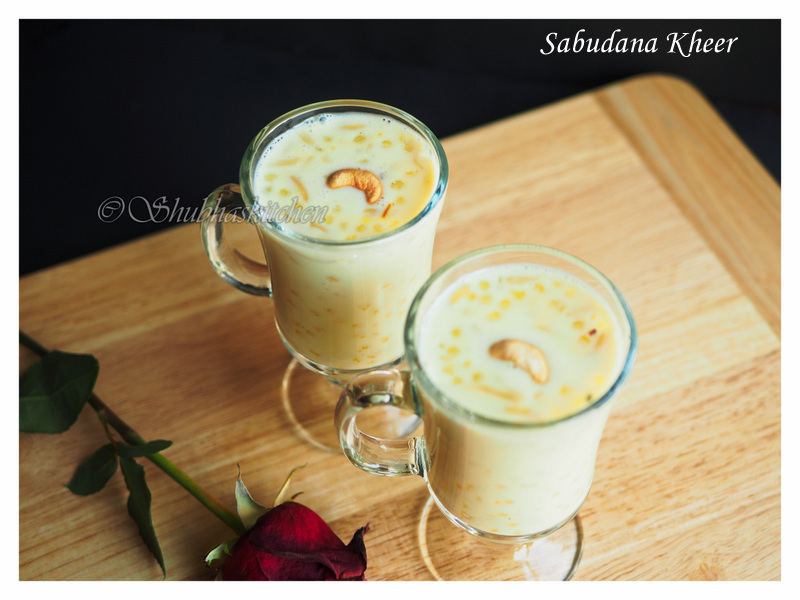 Soaked Sabudana or tapioca pearls are cooked in milk, sweetened and then flavored with saffron and cardamom powder. 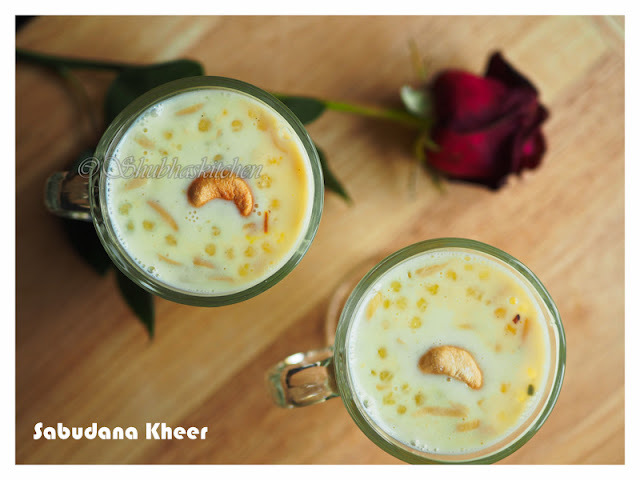 Try this tasty pudding / kheer for the upcoming Diwali. Wash the Sabudana and soak it in 1/2 cup of water for 2 hour. Heat ghee / clarified butter. When hot, fry the cashews until golden. Heat milk in a thick bottomed pan. Add the saffron and slivered almonds to it. 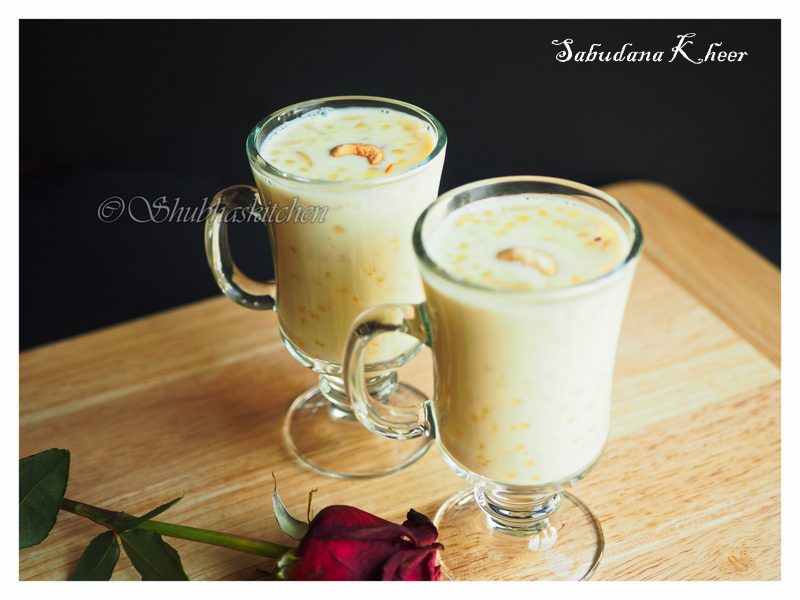 Drain the water from the soaked Sabudana and add the Sabudana to the milk. Cook on low heat . Also add the sugar. Keep stirring continuously so that the milk does not stick to the bottom of the pan. Cook until Sabudana turns transparent and soft. This should take about 15 minutes. Add the nutmeg powder, cardamom powder and fried cashews. Once the Kheer starts to thicken, turn off the heat. Serve hot or chilled. Note :When the pudding cools down, it starts to become very thick. So if serving chilled, add some cold milk. Mix and then serve. How lovely! It must taste just heavenly, I can't wait to give it a try! Yes please. One of my fav, this kheer is such a sheer pleasure for my palate. Very comforting payasam any day...I'm always in for it! !